Top: Lactic acid concentrations were measured in whole lung homogenates using ¹H-PASS nuclear magnetic resonance (NMR) spectroscopy obtained from patients with idiopathic pulmonary fibrosis (IPF) and compared with healthy control subjects. 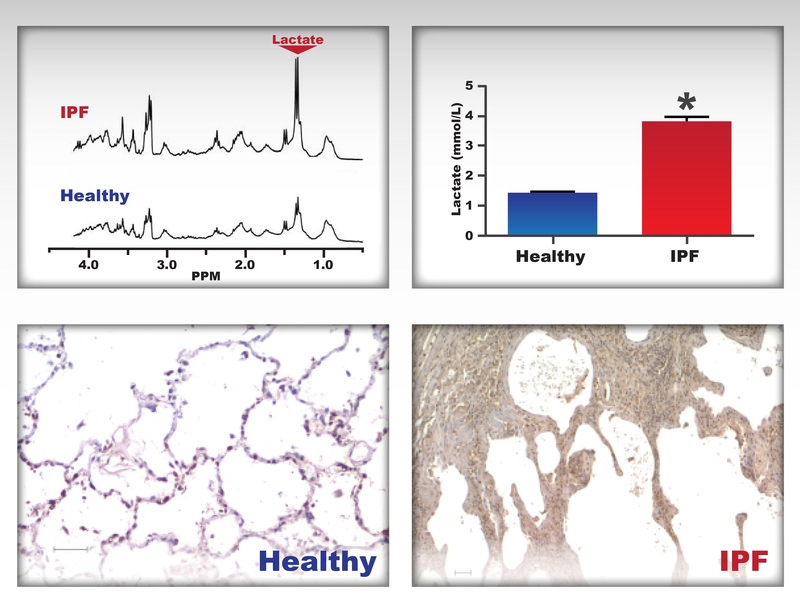 Bottom: Lactate dehydrogenase-5 (LDH5) expression is elevated in fibroblasts and lung tissue from IPF patients. LDH5 is responsible for the generation of lactic acid. Immunohistochemistry is shown for LDH5 performed on lung tissue sections from a healthy control subject (left) and a patient with IPF (right). LDH5 expression, shown as the reddish-brown stained area, is increased in the lung tissue of patients with IPF. Results: Expertise at Pacific Northwest National Laboratory contributed to the understanding of the role of cellular metabolism in the pathogenesis of a currently untreatable lung disease. This research, reported in the American Journal of Respiratory and Critical Care Medicine, highlights the importance of PNNL’s nuclear magnetic resonance (NMR) metabolomics in the field of biomedicine. “This work was, in fact, stimulated by the findings from our metabolic profiling studies,” said Dr. Jianzhi Hu, a PNNL NMR expert and physicist who, with NMR spectroscopist and biochemist Nancy Isern, provided the study’s NMR metabolomics data. The work was led by University of Rochester researchers Drs. Patricia Sime (MD), R. Matthew Kottmann (MD), and Richard Phipps (PhD) and included researchers from Inova Fairfax Hospital Heart & Vascular Institute and George Mason University. Why It Matters: Scientists increasingly recognize that dysregulated, or impaired, cellular metabolism impacts disease processes. However, they know little about the role of cellular metabolism as it relates to lung disease. Greater understanding of the dysregulated processes in human diseases will help in developing improved diagnostic and treatment strategies. Methods: The researchers investigated how the metabolite lactic acid contributes to pulmonary fibrosis, or scarring of the lung. They identified increased levels of lactic acid and increased expression of the enzyme responsible for the production of lactic acid, lactate dehydrogenase (LDH), in the lung tissues of patients with idiopathic—from an unknown cause—pulmonary fibrosis (IPF) compared to healthy controls. Lactic acid, which is typically produced via LDH during vigorous exercise or other anaerobic conditions such as hypoxia, was also elevated in scar-forming cells in the lung called myofibroblasts. The team further demonstrated that the concentrations of lactic acid present in the diseased lung tissue activated an important fibrosis-promoting molecule, transforming growth factor beta (TGF-b). Furthermore, TGF-b was shown to increase the expression of LDH, thereby potentially contributing to a pro-fibrotic feed-forward loop. More important, the team also demonstrated that inhibition of LDH significantly reduced the fibrosis-promoting effects of TGF-b, thus identifying LDH as a novel potential target for therapy for patients with IPF. These data support the role of lactic acid and LDH5 in the initiation and/or progression of pulmonary fibrosis. While the concept of lactic acid elevation in tissue with restricted blood flow is not new, the concept that the elevated lactic acid concentrations are playing a key physiologic role in a lung disease represents a broader understanding of lung physiology. This work also highlights the importance of combining metabolomics studies with translational and clinical research. What’s Next? This study provides an exciting first step for a novel, direct measurement of metabolites and their associated metabolic pathways that are dysregulated in human lung disease. Many more metabolites have been identified as being either increased or decreased in IPF compared to healthy controls. Interrogation of their associated metabolic pathways is ongoing. This investigation is expected to help identify additional novel treatment targets for patients with IPF. In addition, the researchers are expanding their analyses to include other lung diseases, such as chronic obstructive lung disease (COPD), sarcoidosis, and other idiopathic lung disorders. Sponsors: The work was funded by the Buswell Medicine Fellowship, Department of Medicine, University of Rochester; the National Institute of Environmental Health Sciences Center; Empire Clinical Research Investigator Program Career Development Award; The Connor Fund; The Chandler and Solimano Fund; and the National Center for Research Resources. The nuclear magnetic resonance metabolic profiling experiments were performed in EMSL, a national scientific user facility sponsored by the DOE’s Office of Biological and Environmental Research and located at PNNL. Research Team: R Matthew Kottmann, Patricia Sime, Ajit Kulkarni, Katie Smolnycki, Elizabeth Lyda, Thinesh Dahanayake, Rami Salibi, Sylvie Honnons, Carolyn Jones, and Richard Phipps (University of Rochester); Jianzhi Hu and Nancy Isern (PNNL); Steven D Nathan (Inova); and Geraldine Grant (George Mason University). Reference: Kottman RM, AA Kulkarni, KA Smolnycki, E Lyda, T Dahanayake, R Salibi, S Honnons, C Jones, NG Isern, JZ Hu, SD Nathan, G Grant, RP Phipps, and PJ Sime. 2012. "Lactic Acid is Elevated in Idiopathic Pulmonary Fibrosis and Induces Myofibroblast Differentiation Via pH-Dependent Activation of Transforming Growth Factor-β." American Journal of Respiratory and Critical Care Medicine 186(8):740-751. DOI: 10.1164/rccm.201201-0084OC.